Healthcare jobs are experiencing rapid growth in Massachusetts, including LPN positions. The state’s labor division predicts there will be 790 job openings for practical nurses each year between 2012 and 2022. And with the average age of nurses in Massachusetts sitting at 55, a growing number of retirees will soon leave many positions needing to be filled. Massachusetts residents and relocating students looking to start or advance their nursing career can receive LPN training at a number of schools across the state. Close to 1,000 LPN students graduated from Massachusetts-based programs in 2014, and with good reason: professionals in this state receive the third-highest annual salary of LPNs in the entire country. Keep reading for in-depth rankings of Massachusetts’ best LPN programs, a guide on how to earn your nursing license, and a look at employment trends within the state. With a variety of community and career colleges offering state-approved LPN programs in Massachusetts, prospective students can find a program that meets their educational, financial and geographical needs. Start your school search below to uncover the perfect match. Becoming an LPN in Massachusetts is similar to the process used by many other states, but students should still consult these specific mandates to ensure they are eligible to be licensed when the time comes. 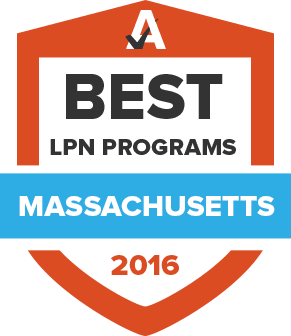 Perhaps the most important step in the journey to becoming an LPN in Massachusetts is ensuring a state-approved program is chosen. The Massachusetts Department of Health and Human Services lists the 27 programs it considers suitable and also provides a list of unapproved programs that attempt to recruit students. Prospective LPNs should review this list carefully as the Board is quick to state that no graduate of these programs will be eligible for licensure within Massachusetts. After completing an approved program, candidates are eligible to sit for the NCLEX-PN examination. They must first apply to the Massachusetts Board of Registration of Nursing and wait for an Authorization to Test notification before registering with Professional Credential Services, an independent organization contracted by the Board to process applications. Candidates should note that they must take the exam within 60 days of receiving authorization and be able to pay the $230 application fee. Once the examination is successfully passed, candidates can expect to receive their license within 21 days. LPNs in Massachusetts are required to renew their licenses every two years. In order to be eligible for renewal, they must show proof of continuing education credits received during the interim. Current LPNs have numerous options for applying for renewal, including an online form, a mail-in paper renewal application, or a visit to the Board in Boston. LPNs working in Massachusetts receive one of the highest salaries of all LPNs in the nation, making it an attractive career for natives and a popular destination for newcomers. While the highest wages are found in Boston, other locales throughout the state offer higher-than-average pay when stacked against comparable cities in other states. Use the tables below to learn about earning potential. While Boston may be the first city most people recall when they think of Massachusetts, the state offers numerous locations for aspiring or current LPNs to find fulfilling roles in a variety of healthcare settings. The tables below highlight some of the best cities and towns and provide data on how these areas are expected to continue growing their LPN workforce in the coming years. ANA’s Massachusetts chapter supports nurses throughout the state by offering continuing education, legislation updates, scholarships, resources, and a career center for jobseekers. Wondering if a particular continuing education credit counts toward Massachusetts Board requirements? Use this checklist to find out. EOLWD maintains up-to-date research and data about LPN careers throughout the state, including information about hot industries and geographical regions for employment. The Massachusetts Health Care Safety & License Verification website can be used to find out the license status of a particular LPN practicing in the state. The BRN serves as the official governing and regulatory body for all nurses throughout the state and provides a variety of helpful information on their official website. This member-based organization serves as the voice of nurses in the Bay State, offering information about unionizing, legislation and resources while also providing conferences, advocacy efforts, and educational opportunities. The Department of Health and Human Services provides a list of pass rates for approved LPN programs in Massachusetts reaching back to 2008. This data can be used to help students find a program with demonstrable results in suitable training. The Massachusetts Board of Registration in Nursing uses PCS to complete all of their licensure procedures. This organization provides a helpful list of information for first time applicants, those who received their degrees in other countries, and details about eligibility. The Board of Registration in Nursing provides a full list of the 27 LPN programs they currently approve, along with information about their locations and contact information.